It is the responsibility of your financial advisor to correctly structure and manage your portfolio. If they fail to do so, we take action – reviewing the necessary documents in order to determine your losses. Utilizing a proprietary software toolset with the highest level of data integrity, we perform a comprehensive investment analysis. 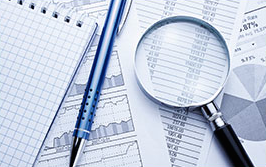 Our forensic reports quantify your portfolio and help to determine whether or not you have a case. 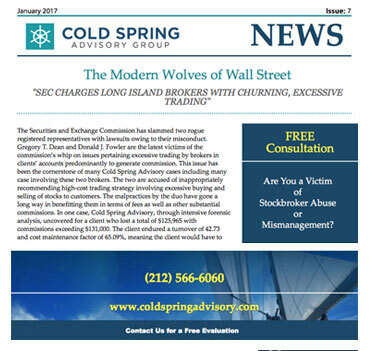 Cold Spring Advisory Group will work closely with the attorney to file the necessary paperwork to proceed with your suit. It is absolutely crucial that this is done correctly as simple technicalities can jeopardize your case. We offer a set of 15 separate reports designed to provide a comprehensive review of the investment portfolio activity during the timeframe under scrutiny. A set of analysis and reports generated for more detailed investigation of the data as related to date ranges, sectors, etc. Examples of this type of analyses include: Combined P&L, Color Combined, Daily P&L, Concentration Analysis, Performance Analysis, Well-Managed Theory, What-If Scenarios, Option Strategy Analysis, Risk Exposure Analysis, Realized/Unrealized Analysis, and Solicited/Unsolicited Analysis. This report offers a snapshot of account performance and a bottom-line figure. The IAS™ Initial Account Overview is designed to show account performance without the expense of a full P&L review. Please note that the IAS-IAO includes monthly activity subtotals, rather than the bottom line figure offered with the PAE. Comparative Analyses offer a direct comparison between two P&L analyses. This analysis typically compares reports prepared by claimant and respondent, revealing any differences in results. When report conflicts are noted, an explanation for conflicting data will be provided. Cases requiring more flexibility may require Custom Analyses, which offer unlimited options. 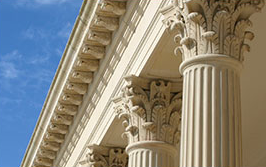 If your case should reach the arbitration stage, we will testify. We stand by our work and we are fully prepared to explain every step in our process. We also provide expert support services to assist with case preparation, and presentation. Securities arbitration is a complicated matter. We have already done the research; allow us to apply it to your case. We have already done the research; allow us to apply it to your case.